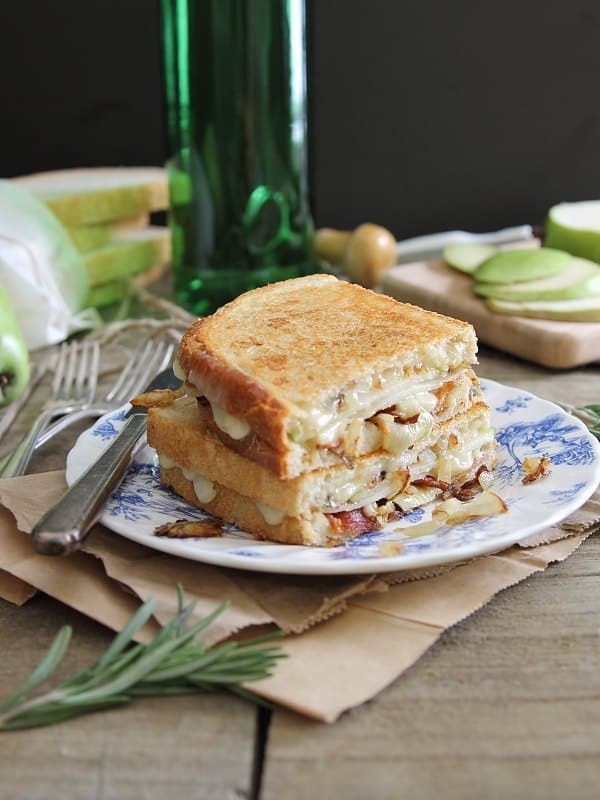 This pear bacon and brie grilled cheese with caramelized onions is sweet, salty and cheesy making it the ultimate grilled cheese. You know how people experience weight loss plateaus? They’re eating right but the scale doesn’t budge for weeks on end. Well, I’m currently experiencing the Crossfit version of that right now. Monday we did Karen: 150 wallballs. For you non-crossfitters that means picking up a 14 pound medicine ball, squatting with it and throwing it 10 feet in the air against a wall, catching it and repeating 149 more times as fast as you can. I got home, wrote it down in my little book and then looked back to see what my last time was. 9:25. Sweet, no progress. Yesterday we did max height box jumps. Last time we did this was in October, I got 34 inches. What’d I get yesterday? 34 inches and nicely bruised shin attempting 34.5″. When it comes to putting a barbell over my head, I’ve been stuck at 108-113 pounds for months. Push press, push jerk, thruster, split jerk, over head squat…all the same. Just like a weight loss plateau, I’m showing up, doing my thing and seeing no progress. The only thing that’s missing is my diet. I could be way more on point with that than I am but then things like pears, brie and bacon float around in my head and I decide it would be a good idea to sandwich them with some caramelized onions between two pieces of sourdough bread, eat it and tell you about it. Pear bacon and brie grilled cheese > barbells. But seriously, 115 pounds overhead would be nice. 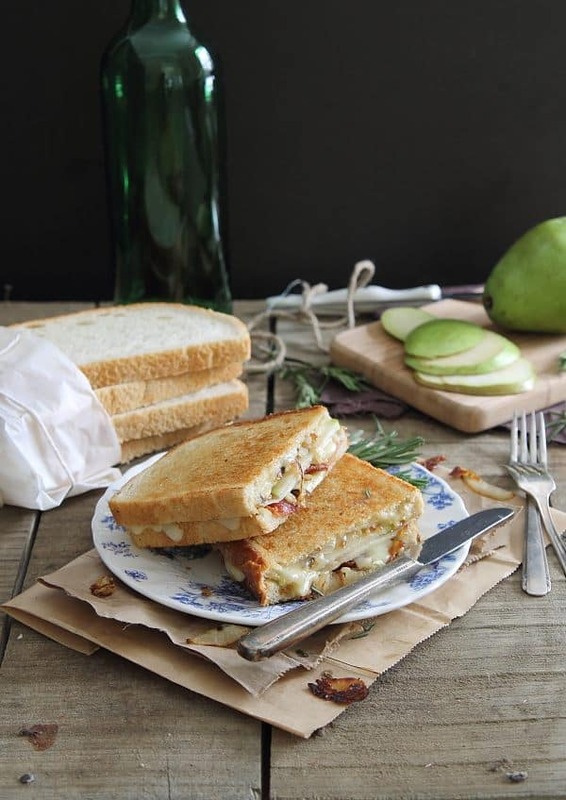 This pear, bacon and brie grilled cheese with caramelized onions is sweet, salty and cheesy, the ultimate grilled cheese. Lay half the cheese on the non-buttered side of one slide of bread. As much as 115lbs would be nice, I am SO glad that you decided to go with the pear, bacon, brie sandwiched between glorious carbs instead. I seriously can’t think of a better combo…and these photos are gorgeous! I could never style a sandwich so pretty! This looks amazing and makes me want to rethink dinner plans STAT. Can I have this for breakfast? You’re such a rockstar. I’m pretty sure I couldn’t lift 50lbs over my head :) This panini looks awesome and I’m loving the addition of sweet and savory. I need this sandwich in my life! I would eat this for breakfast, lunch and dinner! Pear, bacon, and brie. What a brilliant combination! Can’t wait to try this. I do CrossFit also and just wanted to say that those are pretty awesome weights regardless. I can’t even fathom being at that level. And the sandwich looks incredible! Thanks Erin :) Weights are all relative though…we’re each at our own spot and getting stuck at 65 pounds or 165 pounds is still frustrating! haha… bacon > barbells. love it. hang in there girl! You’ll get it! and it’ll just make that 115 that much sweater! I feel this way about jackie. I can do it after 3 days rest or 4 days of wods in a row, when i’m tired, when i’m rested, when i’m sick, when i’m healthy and i always get the exact.same.time. it is SO annoying! Now I want to do Jackie! I don’t think I’ve ever actually done that one before. 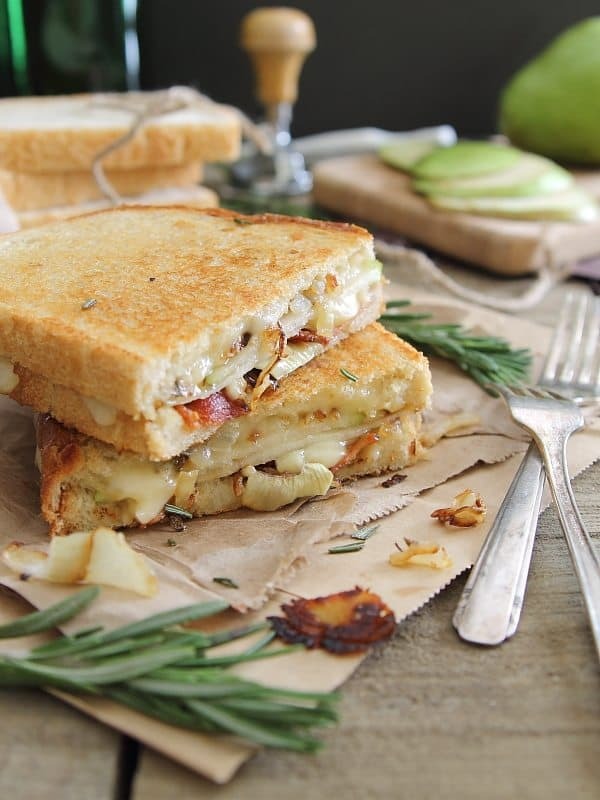 pear, bacon and brie sounds amazing! and I’m super impressed with your crossfit weights. I’m definitely not at that level yet in cfit. Thanks! I sure hope so :) Right now anything at 75lbs is heavy for me! Hey man – I’m all for fitness fitness and such – but dayummm I’d give up a 115 overhead press for one of these ANYDAY!! I think I would die after 5 wall balls. That sounds like one brutal workout. My thoughts are, as long as I’m working out, I get to eat things like cheese and bacon. This sammie looks amazing. Pinned.